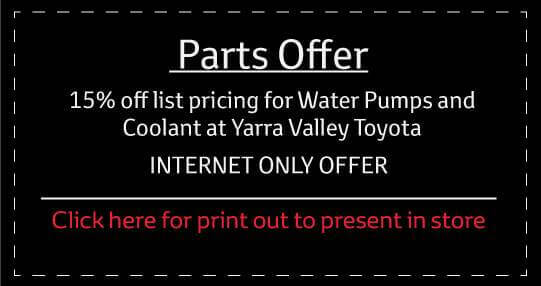 Yarra Valley Toyota stocks every spare part/s you will ever need for your Toyota. While servicing at a Toyota Service Centre like Yarra Valley Toyota, you're guaranteed that we will only ever fit Toyota genuine parts. All Toyota Genuine Parts are made to the same exacting standards as our vehicles, and are designed specifically for each model. Which means each part will fit perfectly and meet the high quality standards of your Toyota. At Yarra Valley Toyota your car will be looked after by Toyota trained Technicians. They work on Toyotas day in day out, so they're both highly experienced and efficient. You also get the advantages of the latest diagnostic equipment as well as the use of Toyota Genuine Parts, covered by a 12 month warranty#.